You don’t need to go to the south of France for a campsite with a swimming pool, sunshine and freshly-baked croissants in the morning. 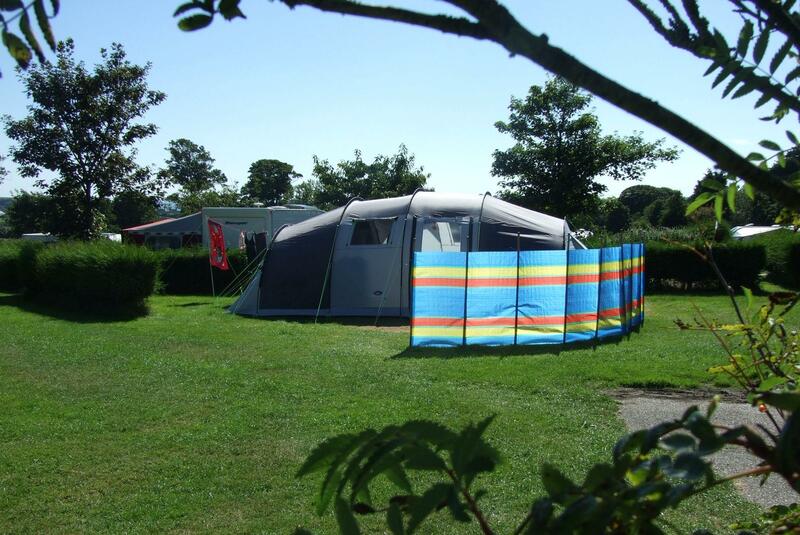 You can find all of it right here in England at Tregarton Park campsite in Cornwall. Okay, so we can’t guarantee the sunshine but as it’s almost as south as you can get, on the Roseland Peninsula, it’s got as good a chance as anywhere in the UK. And anyway, the swimming pool is heated so it should be fine whatever the weather. And while Tregarton has the facilities and amenities you’d associate with a big-brand holiday park, this is a family-run place. It’s large with 125 pitches but they are spread across four meadows and hedgerows mean there’s a bit of privacy between pitches. It’s just two miles to glorious Cornish beaches and close to the fishing village of Mevagissey. 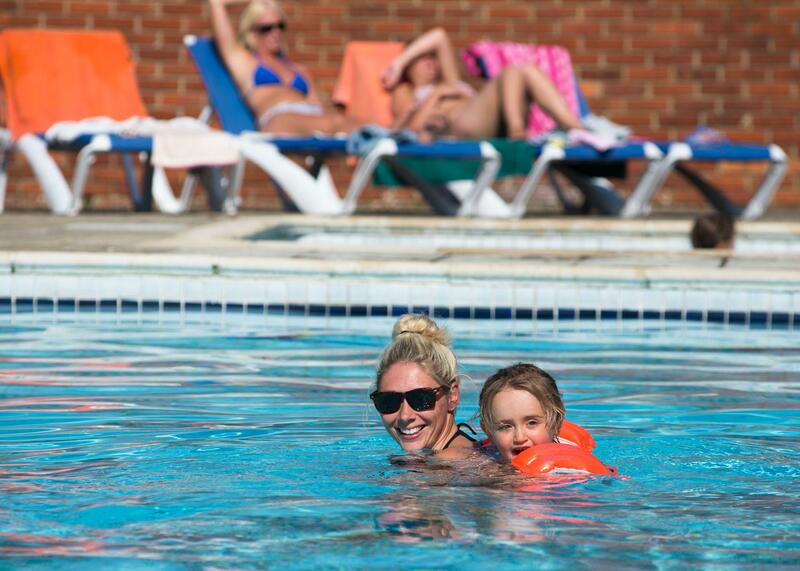 Another campsite with a swimming pool and a continental feel is Ninham Country Holidays. It’s near Shanklin on the Isle of Wight so the ferry journey helps with that sense of foreign adventure. Follow this up with Ninham Country Holiday’s long drive and you feel a million miles from anywhere. There’s no denying that this is a large site. There are more than 200 pitches but they are separated between two areas; the Orchard and Willow Brook. And rather than purpose-built buildings with garish signs, this is a site that’s rather more organic having grown up around existing farm buildings. Everyone is welcome here from bikers with bivvies to caravans but, unlike on some similarly-sized plots, the hikers and cyclists aren’t an afterthought. Turn up under your own steam and you’ll pitch for free. A games room, sports facilities and that all-important heated pool complete the scene. This North Yorkshire campsite proves that it is possible to have the best of both worlds. You can pitch up on a Cool Camping-style tents and campervans-only site – and still get the swimming pool. 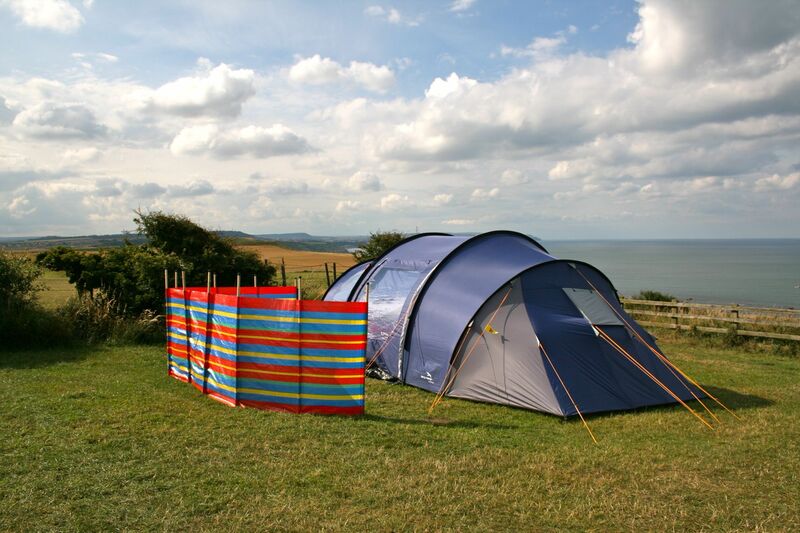 The Crows Nest camping field offers back-to-basics, cliff-top camping with views across the sea in one direction and the Yorkshire Wolds in the other. It’s idyllic but (of course there’s a but) it is part of the larger Crows Nest Caravan Park. It’s thanks to the combined numbers that the site is able to provide excellent facilities which include a children’s play area, indoor swimming pool with waterslides, fish and chip shop and a mini supermarket. This campsite combines a taste of almost everything that’s great about Norfolk. It’s within The Broads National Park and has its own canoe man to take you out on the waterways. It’s got an adventure playground built by the team behind BeWilderwood and while it may not have the royal connections of Sandringham, you’ll be camping in the shadow of Clippesby Hall. 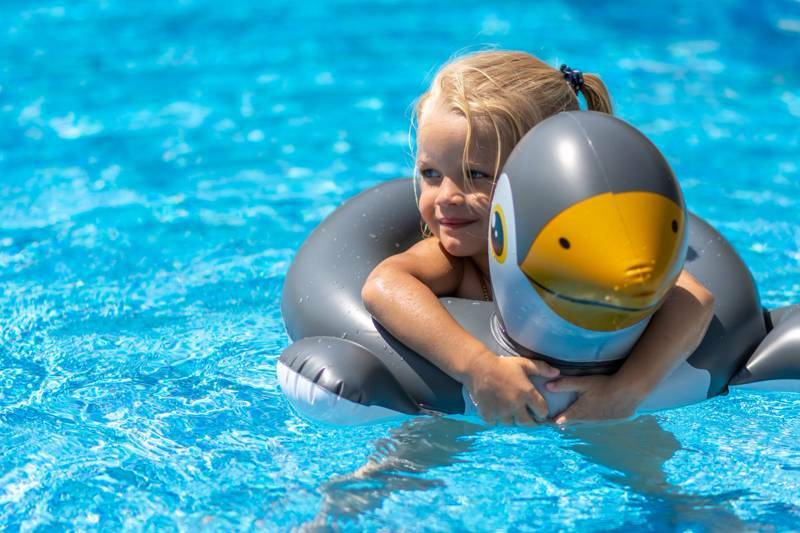 Okay so the outdoor heated swimming pool doesn’t quite make up for Norfolk’s stunning beaches – but it’s probably more pleasant for a dip and your kids will love it. In fact, there’s so much to do here that you won’t need to leave the site. Does that mean that it’s a commercial-feeling holiday park? 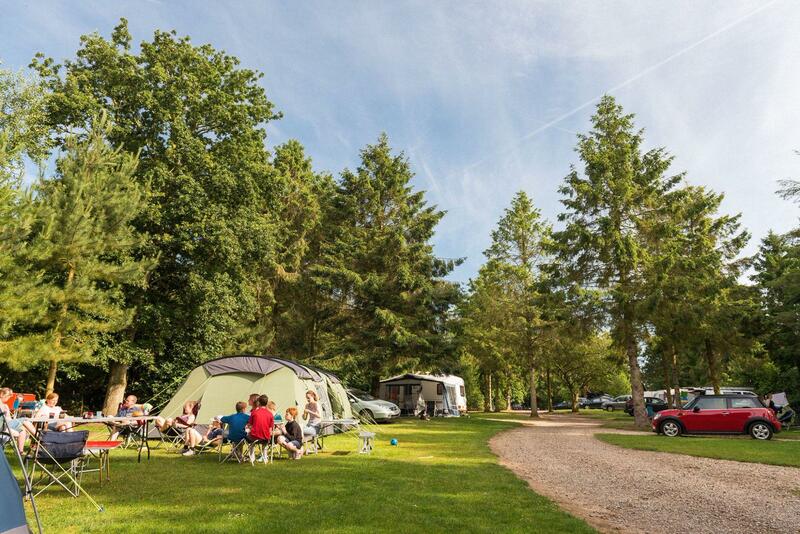 No – there are eight distinct camping areas at Clippesby Hall, from family-camping meadows to wooded hideaways. These manage to provide lovely, quiet camping with the charm of a place that’s half the size. On the edge of the Lincolnshire Wolds, the town of Woodhall Spa, has been tempting visitors with its water since the 19th century. Once it was the supposedly curative powers of spring water that brought them here, now it’s the Jubilee Park lido. The pool and the campsite here are part of the town’s park and owned by the council. Campers get entry to the pool at half price. 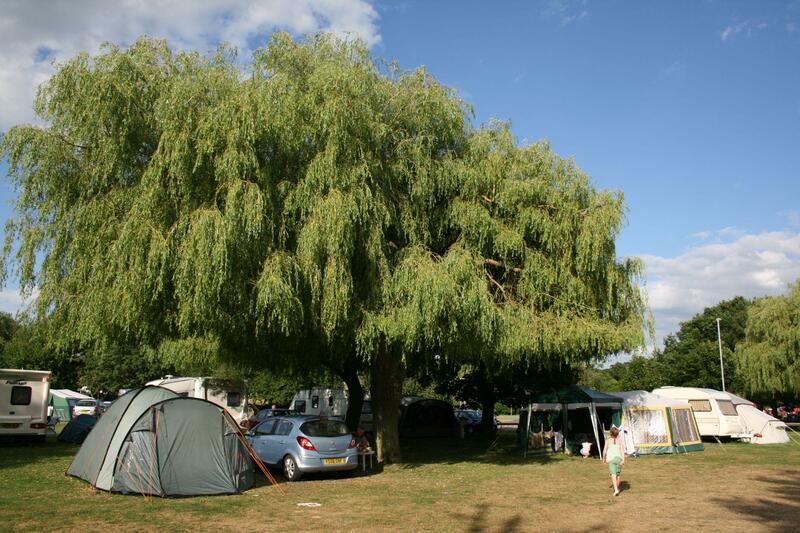 The campsite has been here for decades and it’s got well-established, mature trees and hedgerows that make it feel as genteel as the tea rooms of Woodhall Spa itself. There’s also tennis, croquet, table tennis and a putting lawn as well as a children’s play area. For more choice and camping options, view our entire 'campsites with swimming pools' collection.